Periodic updates on the current stage of project progress relating to the goals of the project. A final conference organised by University of Ghana and UCL took place in June 2017 in Accra. In addition, the project has continued to produce literature relating to sustainability issues in Sub-Saharan African municipalities, including working papers on knowledge exchange processes in local governments, waste management in urban areas and waste-to-energy, and the role of local governments in municipal energy planning processes. The project also hosted a CPD course in Kampala, Uganda in October 2016, hosting over 50 participants from national and local governments, as well as academic institutions and private organisations. Themes discussed at the course include bringing sustainable planning practices to action, the importance of data in energy planning, sustainable technologies and their application in urban areas, policy and regulatory frameworks for urban sustainable energy, and resilience in building design. The fifth SAMSET Network meeting was held in Polokwane, South Africa, from the 25th – 28th November 2015. The main purpose of this meeting was to continue engaging with the project’s municipality partners in addressing their energy ambitions and goals, as well as to report on project progress, engagement progress, and administration for the project. Some key points that were raised across the meetings include the challenges of maintaining the growth of knowledge exchange between municipal partners when staff changes are taken into account, with Ghanaian and Ugandan municipalities both reporting issues with this. In addition, project partners continued to engage with municipalities on their energy goals, with further discussion on where best to apply efforts to take advantage of “low-hanging fruit”, such as Jinja’s interest in solar street lighting. Engagement was another key discussion area in the fifth network meeting, particularly engaging with potential partners in the government and non-government official sphere. Reaching government agencies in SAMSET partner countries can be difficult, and a number of methods, such as reports, online materials, videos and social media were discussed in order to achieve greater engagement with the government/NGO sector for the project. This has the dual benefit of creating further engagement with project partners, and increasing the networking base for municipal energy concerns in the SAMSET partner countries. In an effort to promote further engagement, the SAMSET website has recently been redesigned, along with the social media platforms for the project, as well as the SAMSET Project Youtube channel. 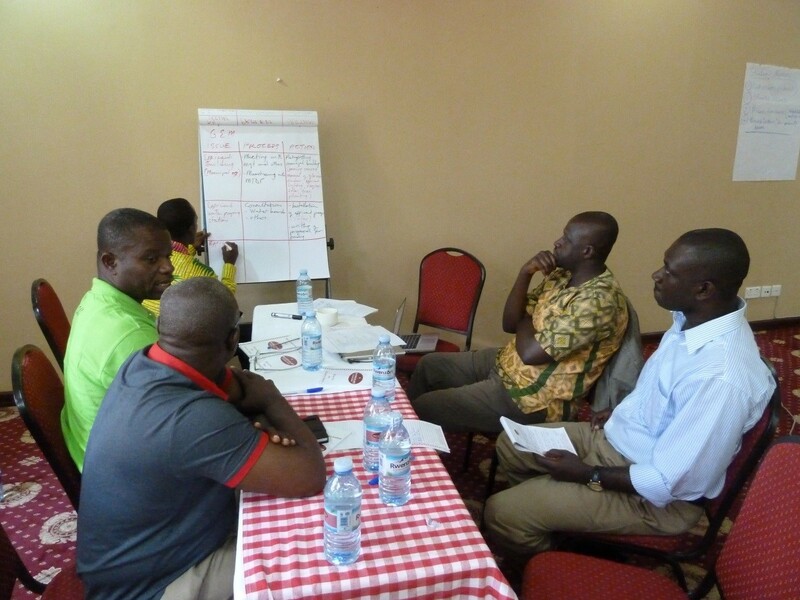 The fourth SAMSET Network meeting was held in Mbale, Uganda on the 18th-21st May 2015. As usual, this meeting brought together members from the SAMSET project partners as well as representatives from partner municipalities in Ghana, Uganda and South Africa. The objectives of this meeting were to strategise further actions and support with a view to the future, and developing plans for the way forward within the project. A number of energy strategies are now being developed within the six municipality partners. The first day of the meeting predominantly focused on updates as to the issues facing partner municipalities including the lack of a clear mandate, and resourcing/personnel constraints. The huge role that local governments can play in a cross-cutting fashion in the energy sector was highlighted. Partnering with local government organisations such as SALGA in South Africa (the South African Local Governments Association) was noted as a useful engagement strategy. Experiences from the data gathering performed by the ISSER at the University of Ghana in partnership with the municipalities of Ga East and Awutu Senya East were also presented. The need to raise awareness of local and national energy efficiency standards and support availability, as well as challenges facing the local residential energy sector such as rapid population growth has been raised. Positive developments have been made, and both municipalities since the project inception are integrating sustainable energy planning into the medium-term development plans. Day two of the meeting saw presentations from all of the partner municipalities on data collection progress and State of Energy/Energy Futures reporting progress, as well as highlighting issues and opportunities within these fields. Number of points were raised, including the importance for municipalities to drive the sustainable project planning process, rather than rely on external agents to improve project credibility; the need to be proactive rather than reactive in sustainable energy planning and address future issues as well as present ones; improving the communication of results from State of Energy reports to government stakeholders at all levels as well as community organisations, and ultimately residents, and the need to keep informality in mind at all times, and not side-line informal settlement dwellers, but instead partner and network with them, bringing them within the remit of the project. Day two also saw also discussion of the Knowledge Exchange Framework developed by Durham University project partners, addressing the methods and modes of municipality energy work in an effort to improve understanding between external actors and municipalities, addressing a key challenge highlighted by all municipal partners in previous meetings. Identifying the socio-technical landscapes of each municipal project partner was the main aim of this session, in an effort to define the niches and opportunities present in each municipality to further understanding of energy goals. Day three was the culmination of the project discussion, with the meeting splitting into country groups in order that the SAMSET project partners and municipalities can further refine and amend their energy plans and objectives going forward, and identify the areas in which SAMSET can support the municipalities. These were condensed into a current Energy Strategy document for further work going forward, listing the current issues and solutions, and proposing support vectors for the municipal partners. Current work in Cape Town and Polokwane municipalities is heavily linked with modelling, particularly in the case of Cape Town. LEAP modelling has been used extensively by Cape Town municipality, and the efficiencies generated by the models are informing on-the-ground projects. The results have also been used to update the city’s Energy Futures Report, an approach the project team considers useful in translating technical information to different stakeholders. More detailed electricity consumption data collection in Polokwane is providing a more nuanced picture of the areas to be targeted for efficiency savings (without industry distorting the overall picture), and the SAMSET project is now being championed by the city’s technical department. In Ghana, the State of Energy Validation workshops held with both Ga East and Awutu Senya municipalities received good attendance and media coverage, and the concept of sustainable energy transitions is now being included in the medium-term development plans of the municipalities. Both municipalities are also keen to work with the SAMSET team in incorporating energy-efficient building measures into new building design codes. Ugandan SAMSET team and partner municipality objectives involve data-sharing on new renewable energy technologies, notably the cost of implementing biogas projects for Jinja municipality for reprocessing agro-industry waste, as well as supporting Kasese in implementing public-private partnerships for new micro-power installations in the municipality. Strengthening data on the energy situation in both municipalities is also a core goal, identifying for example the distribution of cooking fuels and assessing reasons for this, as well as sector-specific energy consumption information. The most notable event in the recent period for the SAMSET project was the first Energy for Sustainable Urban Development continuing professional development course at the University of Cape Town. The most notable event in the recent period for the SAMSET project was the first Energy for Sustainable Urban Development continuing professional development course at the University of Cape Town. This event was attended by over 40 representatives from South Africa, Ugandan and Ghanaian municipalities and universities, and over the course of five days covered the spectrum of issues surrounding sustainable urban development, from urban planning and transport systems to financing for municipal energy projects, sanitation and renewable energy use. Field visits in the course included the Blackriver Parkway office complex in Cape Town, which has recently installed 1.2 MW of solar photovoltaics to supply electricity to the complex, and the informal settlement of Enkanini in Stellenbosch, to visit the iShack project, a solar home system fee-for-service project aiming to create a franchise model for SHS dissemination in informal settlements across South Africa. In-depth summaries of each day of the CPD course can be found on the SAMSET blog. In addition, November saw the hosting of the third SAMSET network meeting, in Kalk Bay, Cape Town. Attendees from each of the project team organisations, as well as from all partner municipalities, were present at the three day meeting. Topics covered included work on the project to date, including presentations based on the State of Energy reports for Uganda, South Africa and Ghana, as well as the discussion of concrete next steps for the project in harmony with the priorities of each partner municipality, and discussions of what assistance the project team can give municipalities in developing sustainable energy transitions. The project team also discussed potential topics for the production of working papers and other academic literature to disseminate project findings. The third SAMSET network meeting was held in Kalk Bay, Cape Town, South Africa, from the 13th– 15th November 2014. This meeting was intended to bring together project partner organisations with representatives from the project’s municipality partners, in order to share the current state of the project, as well as discuss ideas for further collaboration, provide further insight into the challenges facing municipal energy transitions in Sub-Saharan Africa, and discuss strategies for expanding the reach to urban energy stakeholders (for example, municipal/national policy-makers) of the SAMSET knowledge exchange model and research outcomes, mobilising support for energy transitions in the project partner countries. The first day of the network meeting focused on the state of energy in the partner municipalities, and the partner countries more generally. The SAMSET project is working with six partner municipalities: Cape Town and Polokwane in South Africa, Jinja and Kasese in Uganda, and Ga East and Awutu Senya East in Ghana. Both Cape Town and Jinja municipalities have a diverse manufacturing base and a growing (or in the case of Cape Town, developed) service industry, although Jinja still has some platinum smelting installations. Polokwane and Kasese are both rapidly urbanising manufacturing cities. Differences also exist between Ga East and Awutu Senya East, with Ga East being predominantly more affluent and better-serviced, whilst Awutu Senya East has a higher proportion of informality in the residential and commercial sectors. The second day of the network meeting revolved around input from municipal partners as to the ‘dream” of sustainability and sustainable energy transitions in their municipalities. South African municipalities Polokwane and Cape Town noted the issues in disconnection of key departments in municipalities for energy planning, and saw networking with stakeholders as a primary barrier. Ghanaian municipalities notably focused on LPG transport integration, BRT piloting and waste-to-energy piloting. Urban environment transitions including pedestrianisation in Jinja municipality and the creation of pedestrian-friendly zones in Kasese, were the primary goals in Ugandan partner municipalities. The transitions targeted focused around improving the pedestrian built environment, both in terms of seating/lighting/other physical factors, to the improvement of safety. The partner municipalities’ methodology in this transition focuses on awareness-raising and campaigning to build public support for pedestrianisation projects, including regular meetings with community leaders and stakeholders to improve engagement and harmonise priorities. More information on the network meeting can be found on the SAMSET project blog. A significant amount of progress has been made on the key research aims of the SAMSET project in the last six months. The draft knowledge exchange framework produced by Durham University has been updated and finalised as a working version for the coming period (12-18 months). The project team aims to develop this KEF model into a working paper within that time-frame, also. The framework will be useful as a methodology for assessing how best to assist project partner municipalities in energy transitions, as well as being applicable more widely to urban areas wanting to transition to more sustainable operation. Progress is also being made with final versions of the state of energy reports for the African partner institutions’ home countries. Finalisation of data is underway for these reports, with versions hoping to be completed by the end of October. These will be uploaded to the SAMSET website in due course. In addition the modelling work undertaken by the University of Cape Town ERC is reaching a stage of initial release. This modelling hopes to show the energy flows and balances in sub-Saharan African municipaliites, as calibrated from real-life data from project partner municipalities. Finally, case study topics on energy initiatives in partner countries and municipalities are nearing completion, and the most relevant topics from these case studies will be developed into support studies for partner municipalities in due course. Xavier Lemaire and Daniel Kerr from UCL Energy Institute attended a one-day workshop hosted by the LCEDN USES Network on the 8th July, 2014 in London, UK. The event was designed to give insight into achieving impact in low-carbon energy research, and was attended by representatives from the majority of the USES projects, as well as from the major project funding bodies, as well as representatives from business and industry in the low-carbon energy sector. The day began with presentations on impact, engagement and theories of change in low-carbon energy research, and continued with a roundtable discussion on how research users and funders engage with research, and their experiences working with researchers and their outputs in their work. The afternoon session involved whole-room discussions on what impacts could be achieved in the USES projects and what impacts have already been achieved by previous projects participants were involved in. This was then applied to a draft USES project reporting framework, for reporting progress on all USES projects to the primary funding agencies. Further details on the meeting can be found at the SAMSET Project Blog. Preparations are well underway for the second SAMSET Network Meeting, to be held in Cape Coast, Ghana, from the 14th-16th May 2014. This meeting will seek to clarify the progress of the project so far, as well as identify key work areas in the coming period. Literature reviews have been developed on the urban energy situation in the three Sub-Saharan African partner countries, Ghana, Uganda and South Africa. An international literature review on sustainable energy in urban ares has also been developed by UCL, as well as an urban planning literature review by the University of Durham. The process is underway in the three partner countries to provisionally select the project partner municipalities also, following meetings conducted by the ISSER, UMU and SEA to determine the best candidates for partnering with the project. Mailing lists have also been developed by UCL and the University of Durham for project information dissemination to stakeholders in urban energy in the project partner countries and beyond, as well as specifically for urban planners. A list of upcoming urban energy conferences has also been produced, for potential representation at by a member of the SAMSET team, as well as potential journals for publishing project outcomes in. Finally, project administrative tools have been selected, including document-sharing and web-conferencing platforms, and the project web platforms have been created. Representatives from the University of Durham recently visited Uganda Martyrs University to further develop the goals of the knowledge exchange framework, develop questions to challenge the development of the framework, and network with potential local energy initiatives that would be interested in the project. Also, representatives from Gamos have begun netmapping exercises with local urban energy stakeholders in Uganda to further develop the knowledge exchange framework goals for the project.